This is the Great Egret (Ardea Alba) or Common Egret. 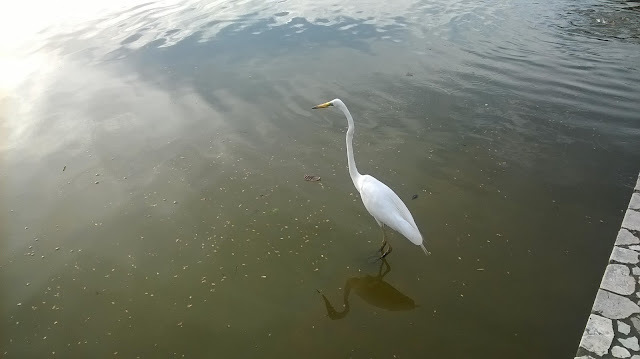 Sometime it is known as the Great White Heron. It is found in Asia, Africa and Australia. But this one; the only one found in the Likas Sports Complex jogging track is unusual. It is tame and isn't afraid of people. When joggers and visitors starts to congregate near the lake to feed the fish, this bird will fly down and display itself catching small fish. It doesn't look hungry. It just want to show off! When the crowd thin out, it will fly back to the tree. It will also display itself gliding at the surface of the lake and finished off its flight to stand near people, especially children as if to tell the onlookers, "hey! I am great, am I?" Look how close I got to this bird to take a shot of this magnificent creater. It didn't fly away! 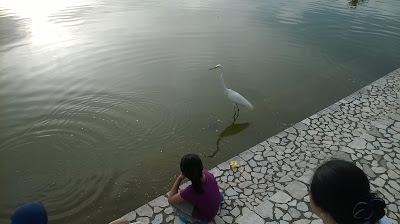 But what is saddening is to see visitors who had never seen a bird so tame, started throwing stones at it. They just cannot appreciate a wild animal could be so friendly. I am worried, eventually we will not be able to see this again in future. The bird might die of injury, or the bird might decided to trust its instinct and fly away; never to trust men again! How sad indeed. 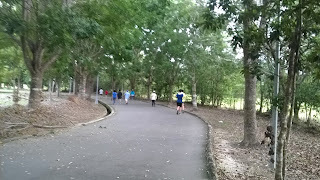 The Likas Sport Complex jogging track is a ten minute drive from the Jesselton (Kota Kinabalu) city center. Since most of the trees had grown so tall, it can be considered a park. At least three times a week, I will walk around this park to exercise my ageing body. I couldn't jog anymore, so walking will do. 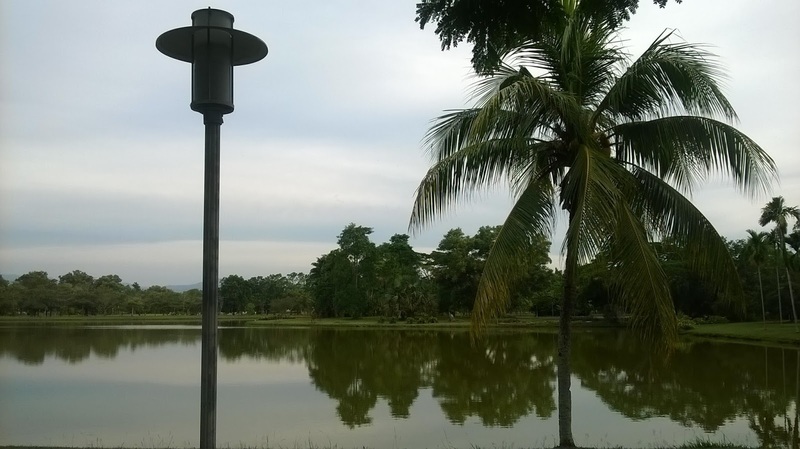 The main attraction of this jogging track is the abundance of fish and other freshwater creatures on this huge lake. It is a good thing that the management of this complex forbade fishing. There are also a lot of dragons (monitor lizard) in the lake. On few occasions, joggers claimed they had seen crocodile swimming in the lake. They insisted it was indeed a crocodile; not monitor lizard. 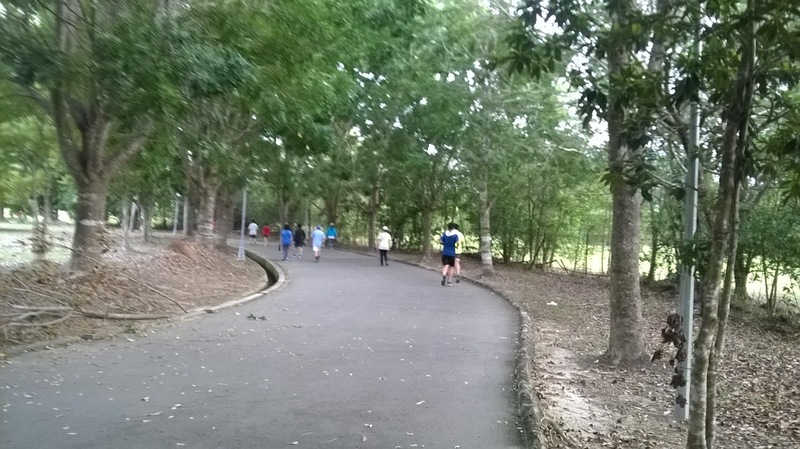 The towering trees by the side of the jogging track are Khaya Grandisfiola. Khaya is believed to be a Mahogany tree, which is good for making furniture. But here, at the park, it just give good shade. As you walk along, you will appreciate the tree for protection against the sun.